What is The Magic Company? 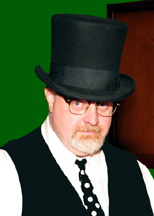 The Magic Company is a business owned and operated by Michael Baker. There are two primary services offered. First are the shows, which have been honed to a very professional level from years of experience and dedication to the art of magic. Michael Baker prides himself in creating magic and illusions that are creative, original, and highly entertaining. Be sure to see our Shows page for more information. Second, The Magic Company is a manufacturer of some of the finest magicians' apparatus available. Magicians and collectors from all over the world have come to recognize The Magic Company's products as museum quality works of art. Be sure to visit our online shop to see for yourself! Read a little about the history of The Magic Company. It's OUR TALE! Do you want to know some of the crazy things that can happen to a magician? Check our true life ANECDOTES! Copyright © 2010 Michael Baker / The Magic Company. All rights reserved.